Constructional security parameters investigation could be performed for both elevated buildings and in course of building construction process. 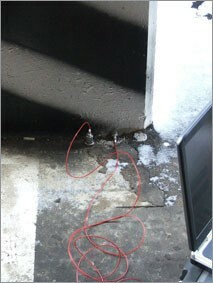 Investigations described below were carried out at one of the biggest Moscow hypermarkets building ground. Our task was to define some vibration parameters for the neighboring shopping center buttress piers and to draw a conclusion of the building safety. The point is that, as is commonly known, any large building primal foundation components are the piles. These piles should be hammered down at a depth of 12-15 meters. 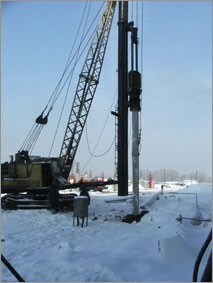 Pile hammering is accompanied by ground shaking formation within a radius of 100 – 200 meters. As a result, it could provoke some local earthquakes formation. There are some earthquake immensity impact factors, a time of year and soil natures are among them. Before pile hammering process start-up in close vicinity to existing building structure, it is necessary to drill a borehole (Figure 3). Then it is possible to hammer a pile (Figure 4). Special vibration-measuring apparatus should be placed in close vicinity to pile hammering point. This measuring equipment should be fixed at building bearing pad (Figure 5). Two special accelerometers should be used to register the impact wave. These accelerometers should be positioned upright (vertically) and horizontally (Figure 6). Software system ZETLAB programs, such as “Multichannel oscillograph” and “Multichannel curve recorder” were used to estimate recorded vibrational acceleration values. The program “Signal recording” was used for the following signal laboratory analysis. Figures 7 and 8 show signal magnetic records values obtained from the vertical and horizontal sensors during pile hammering process (the first three strokes). Then magnetic records for the following stroke set (figures 9 and 10) were estimated too. 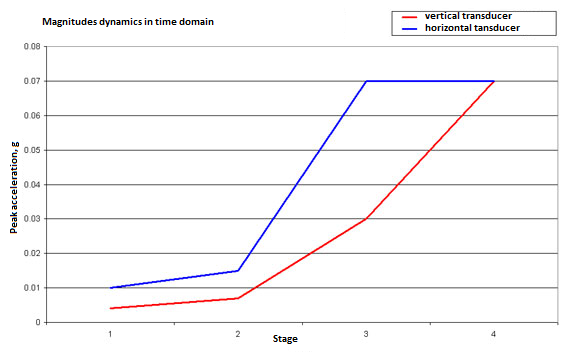 In accordance with any findings, horizontal vibrational acceleration values are larger than vertical ones. This could be related to seasonal factor of our measurements. 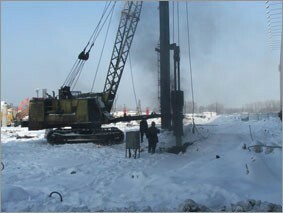 All measurements were performed in winter; surface soil was frozen at a depth of 1-1.5 meters. But strike-slip vibration is more dangerous for any kind of building. Depending on the distance between a hammered pile and a sensor, the measurements for examination of vibration distribution complex were conducted for several buttress piers (schematic plan view is shown in Figure 12). 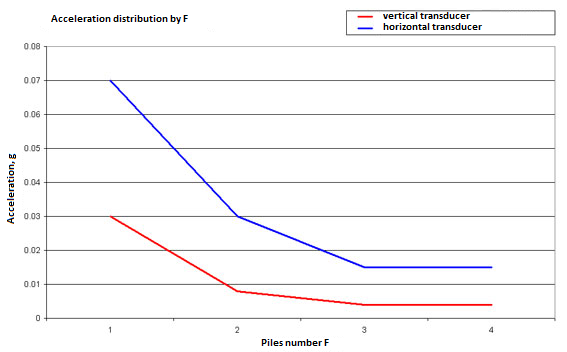 Figure 13 shows vibrational acceleration values distribution graph (buttress piers F1…F4). Vibration value reduction in proportion to the distance from hammered pile is clearly seen. Figure 14 shows vibration magnitude measurement for the buttress pier F1 at various hammering stagers (1 – hammering beginning, the first three strokes, 2 – hammering continuation, 4 – hammering completion). It is possible to develop recommendations about pile hammering methods near existing building constructions according to obtained results. Relevant seismic parameters were additionally measured too, according to seismic intensity scale MSK-64. According to the present standards and limitations for seismically active areas, 7 points earthquake by the MSK-64 scale corresponds to the level of vibration acceleration 0.1-0.015 g. 7 points is a mark for beginning of a building decay. According to obtained measurement results, present vibration level might be recognized as appropriate or inappropriate for surrounding building constructions.